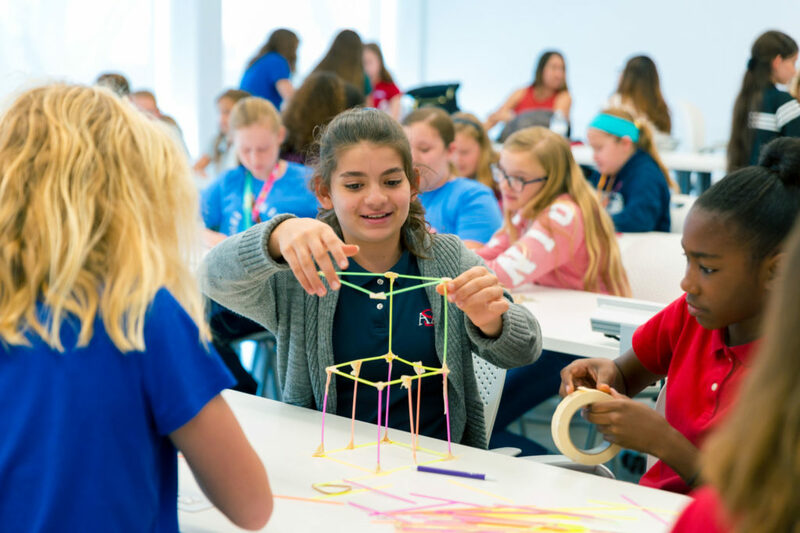 Students from All Saints Academy took part in an engineering design challenge as part of the International Day of Women and Girls in Science celebration at Florida Polytechnic University Feb. 11. 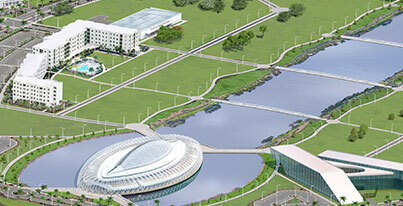 Florida Polytechnic University celebrated International Day of Women and Girls in Science Monday, Feb. 11, at the Innovation, Science, and Technology Building on campus. Florida Poly faculty, staff and students hosted several area middle school students, and the daylong program included presentations from female engineers employed at Walt Disney World, Duke Energy, and Polk County along with a science, technology, engineering, and mathematics (STEM) outreach activity. Jhojana Infante, the assistant director of institutional research at Florida Poly who helped spearhead the event, said the goal was to recognize and celebrate women’s contributions to STEM. Students from All Saints Academy, Lakeland Christian School, McKeel Academy of Technology, and Mulberry Middle School heard from Kimberly Poniatowicz, an industrial engineer at Disney, who shared her experience supporting efficiency initiatives and project analysis. She fielded a number of questions from students, including what types of classes she had to take to become an engineer. Poniatowicz also stressed the importance of girls being interested in STEM. LaQuitta Ghent, Duke Energy Florida’s director of lighting programs, spent a highly interactive session discussing her path from growing up in a small town in Mississippi to earning an electrical engineering degree and now working at Duke Energy Florida. 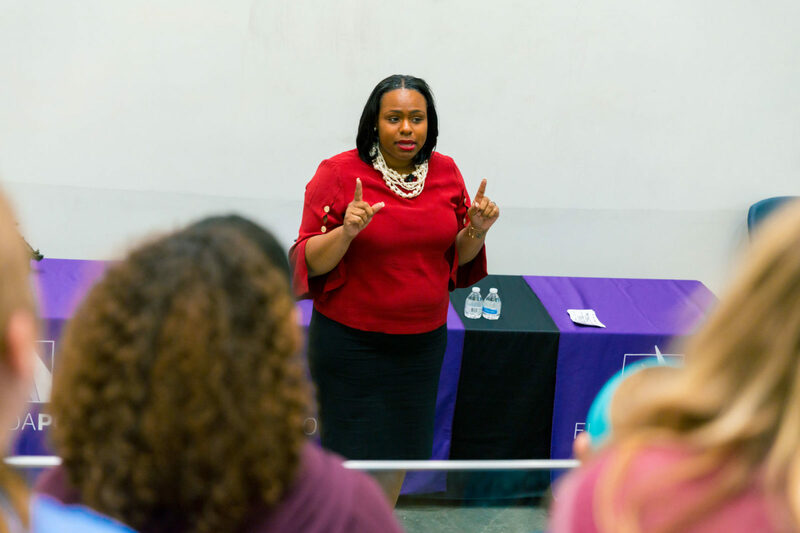 LaQuitta Ghent, director of lighting programs at Duke Energy Florida , was one of several guest lecturers who took part in Florida Polytechnic University’s International Day of Women and Girls in Science celebration on Feb. 11. Ghent told the young students how important it is for them to be their authentic selves and to work hard for what they want. 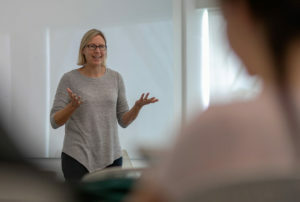 Dr. Susan LeFrancois, an assistant professor at Florida Poly, delivered a lecture focusing on the history of women in science. Additionally, Ana Wood, director of Polk County Waste and Recycling, served as a guest lecturer. Participants also had the chance to view a gallery recognizing former and current female pioneers in STEM. 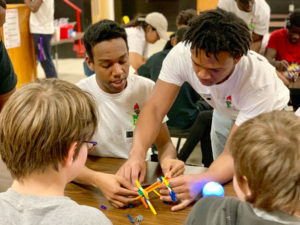 All of the visiting students took part in an outreach activity involving an engineering design challenge led by Indira Sukhraj, a learning and development facilitator with the Florida Industrial and Phosphate Research (FIPR) Institute of Florida Polytechnic University. She told the students how important it was to ask their female mentors and engineers about their paths to success. “Each one of us has a unique experience as to how we got to where we are,” said Sukhraj, who also serves as an outreach coordinator and adjunct professor at Florida Poly. Sukhraj tasked the students with creating a model of a tower that could withstand strong winds – using only straws, paper and masking tape. Later in the day, female faculty and staff at Florida Poly took part in a meet and greet sponsored by the American Council on Education (ACE) Women’s Network of Florida committee at Florida Poly. The event was organized by Florida Poly’s Diversity and Inclusion Committee as well as the Diversity Club. A movie night was sponsored by the Society of Women Engineers. 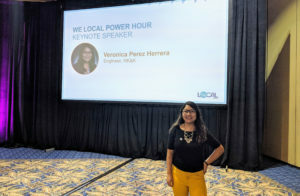 “As a STEM institution, it’s important for Florida Poly to recognize women who have made, are making, and will make a mark in STEM fields and industries,” said Infante. “It shows our commitment to not only support girls and women in becoming STEM professionals, but to help them build confidence and a sense of belonging in STEM.